THE NUMBER OF adults living in emergency accommodation in Ireland rose by 130 last month. Emergency accommodation figures for October show that there are now collectively 9,724 people living in homeless accommodation across Ireland. The number of homeless adults rose by 130 to 5,999 in October. Overall, the number of people accessing emergency accommodation nationally since the previous month rose by 26. Despite the significant rise in adults presenting as homeless, the Department of Housing noted there was a decrease of the number of families accessing emergency accommodation nationally, with 44 less families, including 104 less children. In October, 112 families were prevented from entering emergency accommodation in Dublin, while 70 families exited. New Focus Ireland figures for Dublin also issued today show that one family became homeless every eight hours last month in the capital. The figures show that 89 families with 183 children became newly homeless in Dublin in October. He claimed that the overall increase in people in emergency accommodation can be explained by “new beds being provided to help take people from rough sleeping and into our supported services”. “While it is of course better to see people in emergency accommodation rather than out on the streets, we continue to see an increase in the number of adults seeking help. This underlines the importance of the continued roll out of Housing First, as well as additional supports for single homelessness,” he said. It was announced earlier this month that the Dublin Region Homeless Executive will make 333 extra beds available this winter as it aims to meet a rise in demand for its services during cold weather. Focus Ireland has called for the development of a specific family homelessness strategy, as a result of the scale of the crisis. It has also called to a deadline to be set that no family or person will be homeless for longer than six months. Focus Ireland CEO Pat Dennigan welcomed the fact that the number of people in emergency accommodation isn’t rising as fast as last year. However, he said: “It is totally unacceptable and wrong that at the same time one family became homeless every eight hours in October in Dublin alone. This again shows that there will be no solution to the homeless crisis until the Government takes more serious measures to prevent families losing their homes. Sinn Féin spokesperson for housing Eoin Ó Broin said that “it’s bad news that we have a very significant increase in adult homelessness”. “I welcome the fall in family and child homelessness but because there are lots of families who are homeless and are not being counted in these figures, the figures published today are not worth the paper they are printed on,” Ó Broin said. “We have hundreds of families with children who have been removed from the homeless figures for no other reason than to massage the figures downwards by Minister Murphy,” he said. Those families are still homeless and should be in these figures. Two months saw a decrease in homeless figures for the first time in months. The Department of Housing said those figures followed the completion of an exercise to ensure the correct categorisation of emergency accommodation. More on that can be read here. Ó Broin called for future monthly reports to be carried out by the CSO or the Housing Agency. 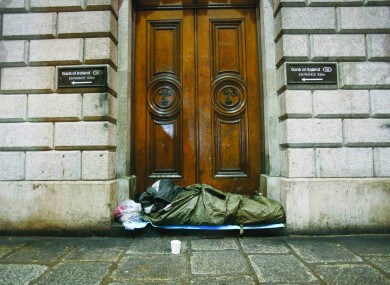 Email “The number of homeless adults in Ireland has risen by 130 in the space of a month”. Feedback on “The number of homeless adults in Ireland has risen by 130 in the space of a month”.